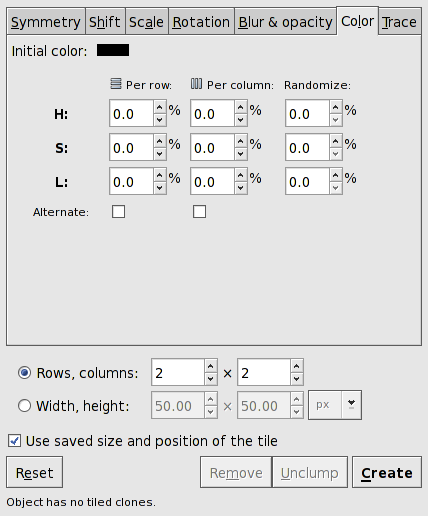 The Color tab allows one to change the Color of each tile depending on the row and column position. The color change is specified in percent for each of the three components of a color specified with the HSL standard (see la sezione chiamata «HSL»). The Hue repeats itself after a change of 100%. The full scale for Saturation and Lightness components are each 100%. The changes in the three parameters can be specified to Alternate between a positive and negative change. A Randomizer factor can also be specified. Two key points: First, the Riempimento and/or Colore contorno must be specified as Unset ( ) (see la sezione chiamata «Fill and Stroke Paint»). Second, an Initial color must be specified by using the Initial color of tiled clones dialog accessible by clicking on the color button next to the Initial Color label. The Color tab of the Crea Cloni in Serie dialog. 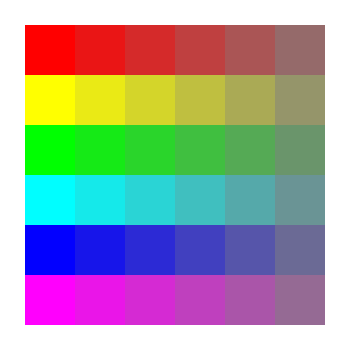 A P1 symmetry tiling with a 16.7% change in Hue per row and a -16.7% change in Saturation per column. The starting color is a red with 100% Saturation and 50% Lightness. A P1 symmetry tiling with an 8.3% change in Lightness per row and a -8.3% change in Lightness per column. 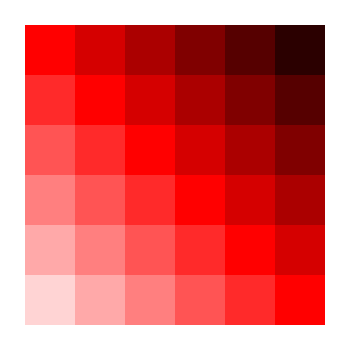 The starting color is a red with 100% Saturation and 50% Lightness.